KIEV, Ukraine -- There is one thing that neither fans of Russia nor patriots of Ukraine in Odessa or Nikolayev can dispute: all totally agree that Russia attacked Ukraine, writes Ramūnas Bogdanas. 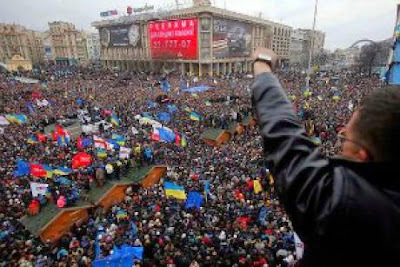 "The jubilation of the first Maidan has remained an unrealised opportunity." Odessa and Nikolayev, where I gave lectures, are part of the so-called zone of Novorossia (New Russia) which Russia dreams of uniting with the stolen Crimea and the zombified Transnistria further east, ripped away from Moldova. And it is a loop that would cut Ukraine off from the sea. Everybody knows that a large force of the aggressor is already concentrated in the area just off the Crimean peninsula. People debate if the Russians are going to attack their cities. And they just can’t come to terms with the fact that it’s actually Russians who are now behaving like this with the Ukrainians, because they believe a truth repeated for countless years – that they are two brotherly nations. It’s a conviction which is now drawing blood. I heard explanations in an attempt to make allowance for objection. There’s fighting because “the powers that be” haven’t shared something or other. An explanation like this comes from the eternal gap between government and the people. The war is perceived as a fight between two governments, and not as defence of the country against occupation. For the people, their country’s independence is not theirs when the government has become just another set of VIPs who hand out golden baguettes, and where oligarchs rule by succession like grand dukes. Privilege and coruption are a colossal foe to statehood in the democratic world. Since 1990, Ukraine has simply drifted, and its businessmen and politicians have for the most part tarnished it. Lithuania is no saint, but its wheels are turning albeit with squeaks. We have attained EU and NATO membership, entered the Schengen area and achieved goals that Ukraine can only dream about. When President Petro Poroshenko bombastically states that no other country in Europe has paid such a price to be a part of Europe as Ukraine has, all he is doing is proclaiming his own exaggerated Ukrainian pride. The silent and unpleasant reality is that it took a belated 20 years to pay this price. Heroism without routine work is a mere flash in the dark. For there to be constant light, there must be constant energy. The jubilation of the first Maidan has remained an unrealised opportunity, because the elected government measures not by country size but by the size of its own pockets. Not far from Nikolayev is the town of Vitovka, reminiscent of the times of the Grand Duchy of Lithuania and of Vytautas the Great. It will not be forgotten that it was here, after the Battle of Grunwald, that the Lithuanians celebrated for three days and missed their chance to consolidate their victory by occupying an important Crusader castle. And when they realised this, it was too late, because the enemy garrison managed to ambush them. It would be good to hope that Lithuania has rid itself of this trait - one which pre-war independence taught us, and that the road back to Europe has been covered. The Ukrainians still need to show that they are moving toward Europe, not only with demonstrations, but with work. A driver for the Odessa morgue said that recently the bodies of dead soldiers had been brought back from Donbass. For him, it is especially painful that it was Russian bullets that killed them. He does however know that in Crimea, Russian pensions will be three times higher. What he doesn’t think of is that things there are also more expensive. His salary is 1,500 hryvnia (€92). It’s difficult to conceive of a country that measures everything by work. The defining factor is not who speaks Russian or Ukrainian, but rather how each person perceives public spirit. You could tell students in Odessa that in 1990 Lithuania’s GDP per person was lower than that of the Ukraine and that today, it’s three times higher. It’s clear that the path we’ve chosen seems more constructive. But you can’t by any measure smooth over the daily wage on which it’s impossible to survive. Few have any regard for a place where there’s no underlying structure, something with which it becomes a fortress in which most people feel secure. Without it you could rob shamelessly or leave in disgust. All people spoken to acknowledged that the Ukrainian army is poorly armed. Yet aren’t they and their friends glad that they can buy military goods for next to nothing at the markets? And that they can trade in anything, be it selling weapons to other countries, or shoes at the market. Now people opt for money to buy weapons, helmets and armour. A village has collected money for a helmet for a volunteer going off to join a battalion. And after finding out, a local politician who has nothing to do with the place flew in with the cameras and ceremoniously presented the helmet. Nikolayev University lecturers have decided that their contribution will be a “professor armour “who at his own expense will buy up what’s in storage, and prepare for battle. For Ukrainians who previously enjoyed a porous border across which you can take whatever you want, you nevertheless still had to pay off the border guards. The ones who bribed so that they could smuggle were the ones who taught the border services to eventually let the first tanks through, for money from Russia, to the separatists. Recently there’s been a feeling of déjà vu in Ukraine. Students question whether Ukraine can survive intact, or not without full links with a very powerful Russia. Before answering, remember Algirdas Brazauskas’s lament that without the Soviet Union, the Lithuanian maiden will surely perish [Brazauskas is the first President of post-Soviet Lithuania]. Ukrainians still have to answer the questions, the answers to which we are pointing. As a visitor, there is a clear perception that Lithuania is already on the long road that awaits the Ukrainians. It’s important that we take stock and not be in awe of what we’ve achieved, because on the reverse side there are sores that must be treated and cut out with a scalpel, so that in the future we’ll be able to show good practice as an example to Ukraine. We are, after all, waiting for them with baited breath in Europe.